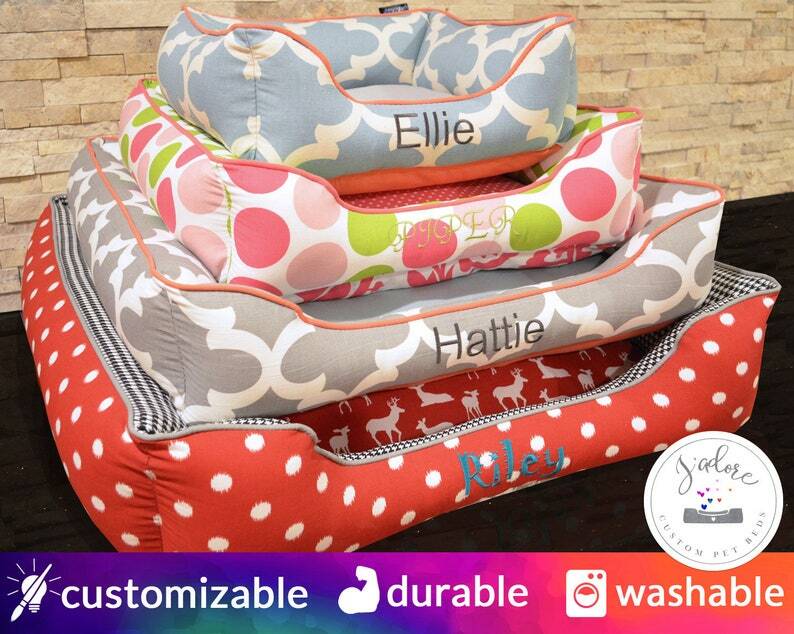 The reversible, washable Cuddle Bed is an original design by J’adore and embodies our core values of comfort, design, durability, and functionality. Our beds are stuffed heavy to offer your loved ones longer lasting support. To prove this, we advertise our weights (see below) so you can compare ours against other pet bed manufacturers. I have 3 dogs and ordered 1 for each of them. The beds are incredibly well made and beautiful! Alisa was a joy to work with. Love it! My kitty love it too! Great quality and fabrics! The best cat bed for our Lila Moana! Thanks for the little toys, she love it! Navy Blue Dog Bed Cat Bed Personalized | Washable Bolster Bed, Small, Medium, Large, Chartreuse Green, Stripes, Polka Dots | Ships Fast!